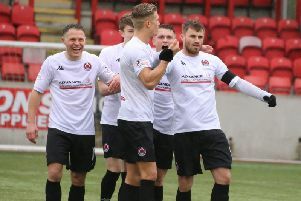 It’s back to business for Clyde this week as they resume their push for promotion from league Two with a home match against Berwick Rangers. The Bully Wee had a day off from competitive action on Saturday following their early Scottish Cup exit. Instead they travelled through to play East of Scotland League side Linlithgow Rose in a friendly match, which ended in 1-1 draw. Boss Danny Lennon said: “It was a very good exercise, it kept a lot of the boys ticking over that haven’t had a lot of game time of late. “It was a good wee challenge, playing on a tight pitch. We’ve got those sort of games coming up where we’ve got those sorts of surroundings to deal with. But it’s back to Broadwood for the ‘real thing’ this week - and Lennon admitted his side still haven’t hit the heights he would like on their home patch. He said: “I still feel that we’re not firing on all cylinders at home as of yet. “That can be a factor of the way that teams set up against us, but we’ve got to rise above that and make sure that the boys know they have the tools in the bag and what tool to use at any given time.